​A rubber boot that works as hard as you do is nearly impossible to find but your search is over! Backed by over 70 years of footwear manufacturing expertise, the Quatro® Boot is hand-built specifically for the agribusiness industry and designed with the highest level of comfort and durability. 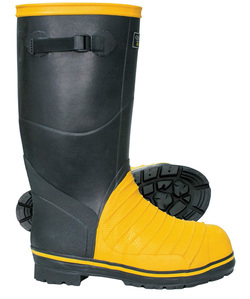 ﻿A rubber safety boot that works as hard as you do is nearly impossible to find - but your search is over! Backed by over 70 years of footwear manufacturing expertise, the Quatro® Miner is hand-built specifically for safety and crafted with the highest level of comfort and durability in mind to provide all-day comfort.